A duo, probably helped by session musicians, that made the above melodic progressive albums, which are keyboard dominated. They were from Argentina and they also contributed Canción Para Mi Muerte to the live compilation Haste Que Se Poyga El Sol (1973). This track is an acoustic ballad with guitar, piano, drums and harmony vocals. Vida was recorded with assistance from various members of La Pesada. It contained catchy folk rock tunes and lyrics which dealt with everyday problems youngsters faced. Among its finer moments were Dime Quién Me Lo Robo and Cuando Comenzamos A Nacer. García penned all the material on their second album Confesiones De Invierno. It followed a similar formula to their first. It produced some memorable songs Aprendizaje and Rasguña Las Piedras and again many La Pesada members participated. Their third album was more symphonic and featured more socially aware lyrics. The duo was supplemented by Rinaldo Rafanelli (ex-Color Humano) (bs) and Juan Rodríguez (ex-Los Mentales) (drms). Parts of the album were censored and some songs were removed. A number of other musicians guested on parts of the album. It proved to be their swan song so far as studio albums were concerned, for García and Mestre decided to go their separate ways. A farewell concert was held at Buenos Aires' Luna Park Stadium on 5th September 1975. The two night show was filmed for a movie and a two album set (available separately) Adios Sui Generis. Charly Garcia went on to form La Máquina de Hacer Pájaros and later Seru Giran (which included David Lebón). They became the country's top band in the late seventies and early eighties. He later went solo and became phenomelly successful. Nito Mestre went solo too, but with far less success. Sui Generis is one of the most important rock and roll (or folk rock) bands in Argentine history, enjoying enormous success and popularity during the first half of the 1970s and a following that has lasted to the present. Although long since disbanded, Sui Generis reunited in 2000 for a concert in Boca Juniors’ Stadium in Buenos Aires. 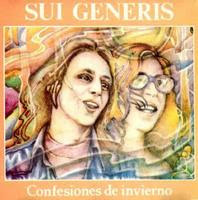 Sui Generis was formed in 1969 by the merging of two bands: "To Walk Spanish", originally led by Carlos Alberto "Charly" Garcнa Moreno and "The Century Indignation", originally led by Carlos Alberto "Nito" Mestre. The newly-formed band's member list consisted of, Charly (piano), Nito (flute) Alberto Rodrнguez (drums), Alejandro Correa (bass) (later replaced by Rolando Fortich), Juan Carlos Bellia (guitar) and Carlos Piйgari (guitar and vocals). Sui Generis is the predecessor band of SerъGirбn and La Mбquina De Hacer Pбjaros.